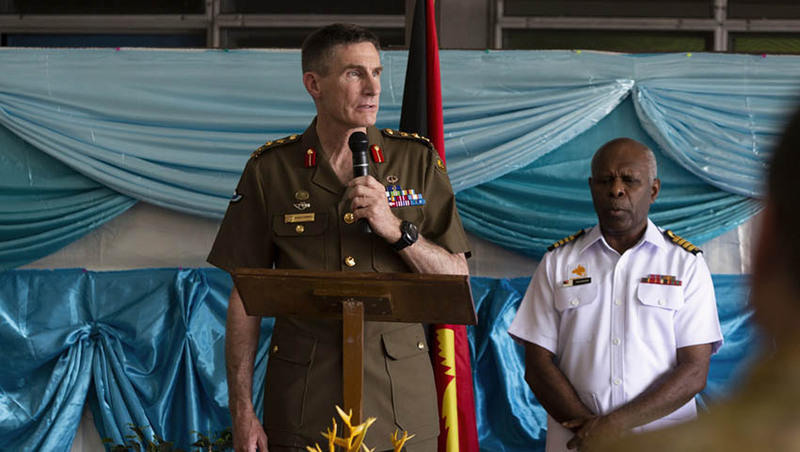 Chief of the Defence Force, General Angus Campbell, AO, DSC, has travelled to Vanuatu, Tonga, Fiji and the Solomon Islands, building on the Prime Minister’s recent tour of the region to strengthen Australia’s position in the Pacific. GEN Campbell was accompanied by the Commissioner of the Australian Federal Police, Andrew Colvin APM OAM, Commissioner of the Australian Border Force, Michael Outram APM and the Deputy Director-General of the Australian Security Intelligence Organisation, Peter Vickery. GEN Campbell said he was honoured to have the opportunity to meet with his Pacific counterparts during his first official visit to the region as Chief of the Defence Force to discuss current and future areas of defence cooperation and discuss shared security challenges. “Australia has a long history of working alongside our Pacific Island partners to support capability development, respond to common security challenges and build interoperability and resilience across the region," GEN Campbell said. During the visit, GEN Campbell met with Acting Commissioner of the Vanuatu Police Force Kalo Willie Ben, Chief of Defence Staff of His Majesty’s Armed Forces (Tonga) Brigadier General Lord Fielakapa, Commander of the Republic of Fiji Military Forces Rear Admiral Viliame Naupoto and Commissioner of the Royal Solomon Islands Police Force Matthew Varley. “Defence plays a key role in this endeavour. We are and will continue to enhance our security cooperation with our Pacific neighbours, building on our existing and long-standing engagement, including under the Defence Cooperation Program,” GEN Campbell explained. CDF’s tour of the Pacific region comes following an Australian pivot to the region, first announced by Prime Minister Scott Morrison at the 2018 APEC Summit held in Port Moresby, Papua New Guinea. “I have already made it clear as Prime Minister that Australia is stepping up. We will step up as part of our ‘step-up’ initiative in Pacific. We are taking and will take our engagement in the Pacific to a new level,” Prime Minister Morrison said in his address to the APEC CEO Summit. As part of Australia stepping up it’s commitment and presence in the Pacific, the government announced a $2 billion Australian Infrastructure Financing Facility for the Pacific, which was created with the view of supporting partners within the Pacific. However, Vanuatu is concerned about their lack of inclusion in the PNG-Soloman Islands underwater cable initiative. Australia will also provide training and infrastructure upgrades to support the domestic security and defence capabilities of regional partners like Vanuatu, with the Prime Minister outlining an expansion of the island nation’s police force and the appointment of a new Australian defence adviser in Vanuatu. The growing strategic, economic and political competition between China, the US, Japan and Australia also served as a central point of concern for the Prime Minister and the nation’s continuing commitment to regional peace, prosperity and stability. “I said when I outlined our step-up initiative that we were happy to work with all partners through the region, whether it’s the United States or China or indeed of course Japan... I’ve set out some very clear markers and criteria of where countries can work together. Now, that’s what we’re doing with the United States and Japan and, as cases present themselves, we’d be very pleased to do that with China as well,” Prime Minister Morrison explained to the APEC leaders. Australia’s growing economic and strategic pivot to the Pacific provides new opportunities for Australian businesses of all shapes and sizes as the nation continues to invest in both regional infrastructure and defence capability to ensure the enduring peace, prosperity and stability of “our patch”.